A common refrain among collectors is that there hasn’t been enough innovation from the card companies in recent years. While the 1990s saw the introduction of refractors, relic cards, and certified autographs to the collecting world, we’ve seen very little that’s really unique in the past decade. It seems that every new card product features a certain number of autographs and relic cards per box, and serial-numbered parallels featuring different colors or mini versions of the base cards. So I think it’s praise-worthy when a card company comes up with an idea that really is innovative, and they don’t over-do it to the point that collectors quickly become bored of the idea. 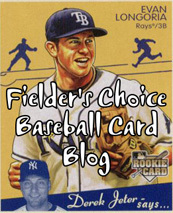 One such recent idea is the Topps silk card. Honestly, my first impression of silk cards was that they were kinda lame. It’s hard to imagine the Topps product development meeting where somebody stood up and proposed making miniature versions of cards out of silk and encasing them in a hard plastic frame. But someone at Topps did indeed think of that idea, and Topps began producing silk cards for the first time in 2006 Turkey Red. Since then, they’ve expanded the concept into Allen & Ginter, T-206, and the Topps flagship set. As silly as the idea of silk cards sounds at first, I have come to greatly appreciate them. And I think that there are two factors that contribute to their greatness: their uniqueness and their rarity. You can’t deny that silk cards are unique. There’s really nothing else like them in the hobby. Over the years, the card companies have tried so many methods of making a card look different (foil, chrome, refractors, die cuts – just to name a few), that it’s cool to see a card that feels different. So many collectors are looking for something interesting and different to add to their collections, and silk cards definitely fill that niche. In an era when so many products are dominated by the same old single-color “relic” cards, most of which aren’t worth more than a few bucks, it’s refreshing to get a different type of “hit” in your packs. Do some searching on eBay, and you’ll find that silk cards of average players almost always sell for higher prices than plain relic cards of stars. And then there’s the rarity. In most products that include silk cards, they are serial numbered to 50 without any parallels. I’m pretty sure that there has never been a silk card that’s had more than 99 copies. And it definitely helps that Topps has limited the amount of products that include silk cards. While you can get relic cards in just about every new card product, Topps has never produced more than three sets with silk cards in a year. And of course, Topps is the only company that has produced silk cards so far. All of these factors make silk cards truly rare, and very desirable. I’m planning to put this card up for sale on eBay soon. If anyone out there is interested in this card, I’d be willing to sell it for $20 before I put it on eBay. That would save me from the eBay and Paypal fees and you from trying to outbid a bunch of people. I love the idea of the “silk” cards and can’t wait to eventually pull one. 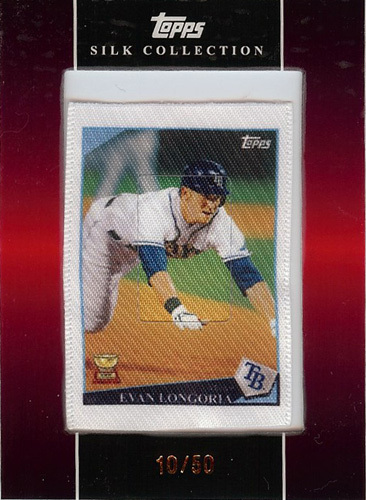 Do you think Topps might take it to the next step – entire cards made out of jersey swatches? If they can print on cloth, can they print on polyester or whatever uniforms are made of? Oh and welcome back Dave! I LOVE silk cards! I pulled one (a Marlin) last year out of Topps series 2 and it was great! I have 2 Rays-an Aki and Kaz. 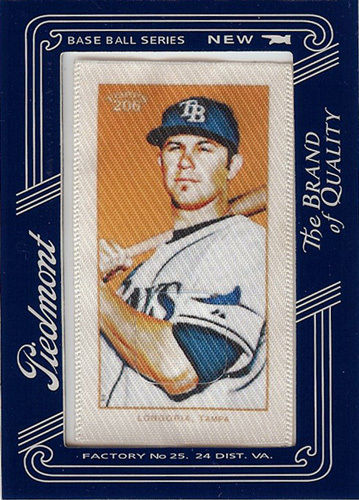 I think Topps struck gold with the idea and there is no additional certification or wonder where the jersey came from. Add in the nostalgia factor and the throwback to silk rules! Ichiro has a pretty crazy and loyal following overseas. If you can handle the fees and international shipping that may occur, you might have a pretty nice transaction on your hands! I’ve never seen one of these in person, but the concept is intriguing. Anything that brings innovation to the market is a plus in my opinion. BTW, welcome back to blogging. And no, I haven’t forgotten that I owe you a prize for winning the First and Goal Fantasy Football League. I have just been very busy with work and home and never put together a package for you. Hopefully I can get that out soon! sorry to say i really dont get it. I think the silk cards are a great idea. I would love to have one. I like the original silks from the turn of the last century, but the new silks just don’t seem right to me with such busy graphics. They just remind me of some weird thing I would pick up at a flea market. 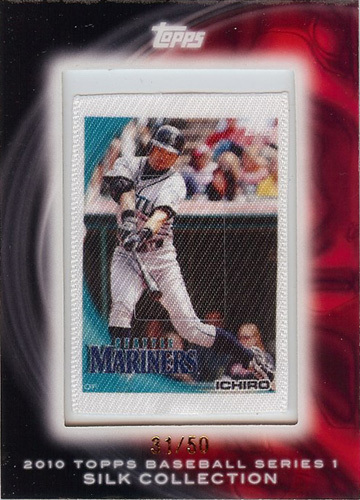 The Ichiro card is pretty slick though, I gotta admit. That is a great pull. The silk cards are not a new idea. Early 1900’s cigarette inserts were sometimes printed on silk. It was common for these silks to be sewn together into cushion or quilt covers. I love the fact Topps are producing these. I have a few of these silks that are graded by verisleeve.com – they look really good and i’m interested in buying more of them. Let me know if you're interested in a link exchange!